Jim and I have complementary minds. An idea from one of us sets up echoes in the brain of the other. Jim has a fantastic grasp of magical literature, and a high intelligence that puts his knowledge to work. The methods he comes up with are often unusual and always interesting. For me, they start wheels turning. I take the method, or nucleus of method, and begin re-shaping it for entertainment value...then I lay it in the laps of a live audience. 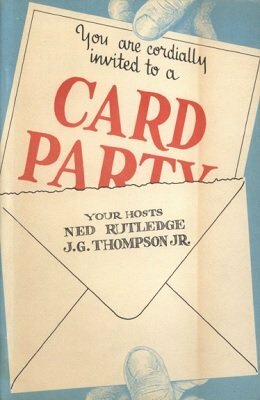 This book is about cards ... another we've written is about mind-reading. You won't have to share the work that went into them. But we hope you'll share the pleasure. How's That Again, Mr. Hoyle? Message From Garcia ... And Thompson! And Rutledge! 1st edition 1965, 70 pages, 1st digital edition 2018, 68 pages.